NOTE: These were amended Tuesday morning after the original calculation didn’t include entries from the 200-meter dash. NEW ORLEANS – It all comes down to this. The best of the best from the outdoor season are set to converge on La Crosse, Wisconsin this weekend for the biggest meet of the year: The 2018 NCAA Division III Outdoor Track & Field Championships. If the final Men’s National Team Rankings of the season have any say in the matter, a team is about to claim its first national team title in seven years. This final iteration, released Monday by the U.S. Track & Field and Cross Country Coaches Association (USTFCCCA), only takes into account entries into the national meet to give a true idea of who is favored to fight for the title. North Central (Ill.) opened the year as the preseason favorite and that’s how it will be entering the final meet of the year. 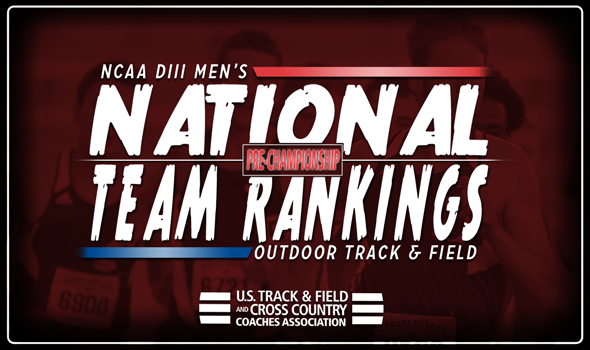 The Cardinals, who haven’t won an NCAA outdoor title since 2011, hold a commanding lead in the National Team Rankings. North Central (Ill.) has 12 NCAA entries that are ranked in the top-10 nationally, including five in the 10,000 alone. Dhruvil Patel and Luke Winder are expected to bring home major points for the Cardinals as well in the 5000 and pole vault, respectively. UW-La Crosse, ranked second, will look to spoil the fun for its guests this weekend with hopes of winning its fifth outdoor title in the past six years. The Eagles, who won in 2013 and 2015 through 2017, own nine top-10 marks with Ernest Winters and the 4×100 relay team, which Winters is a part of, holding down top spots nationally. Rowan sits No. 3 in the final index of the season. The Profs bring seven top-10 entries to the NCAA meet, including a pair of No. 1 marks: Bobby Cooks in the 110 hurdles and Jeffrey Jon Tucker in the high jump. Nothing changed either for the fourth- and fifth-ranked teams from Week 7, as UW-Whitewater and Augustana (Ill.) round out the top-5 once again. The Warhawks are looking for Parker Witt to cap his career with a few strong performances, as well as a trio of men in field events. The Vikings have four entries ranked in the top-3 nationally, including Cody Wheeler, the top-ranked hammer thrower in the nation. Here are the teams that filled out the rest of the top-10: No. 6 St. John Fisher (up one spot from No. 7), No. 7 Mount Union (up 5 spots from No. 12), No. 8 UMass Dartmouth, No. 9 George Fox and No. 10 UW-Stout. Be sure to check back later this week as we’ll preview the meet and provide a recap following the final day of competition.